I’m sure you have been wondering why I haven’t posted much during this past month. I always have more to say. camping. I love girls camp, however. I know it doesn’t make any sense. I guess I just love hanging out with 32 girls between the ages of 12 & 18. LOVE THEM! What I hate about camping is everything else. Seriously. I was hot and dirty for 3.2 days. After the first night I woke up to my bladder around 5:00 a.m. I unzipped my sleeping bag. Ugh. What is that smell? Oh great it’s ME! The smell only intensified with each day. Why on earth would they lock up the showers???? Huh?? Please…really? You have showers, but keep them locked? One other gripe. Banning the shaving cream war? Please…really? I lived for the shaving cream war! I purchased a “Super Soaker CPS 3000” for the shaving cream war 10 years ago. I was THE warrior. I was only taken down once…maybe twice. Thank goodness it’s over and will only stand as a wonderful memory. I’m back, showered and ready to blog. My number 2 college son started making his own ginger ale syrup years ago. 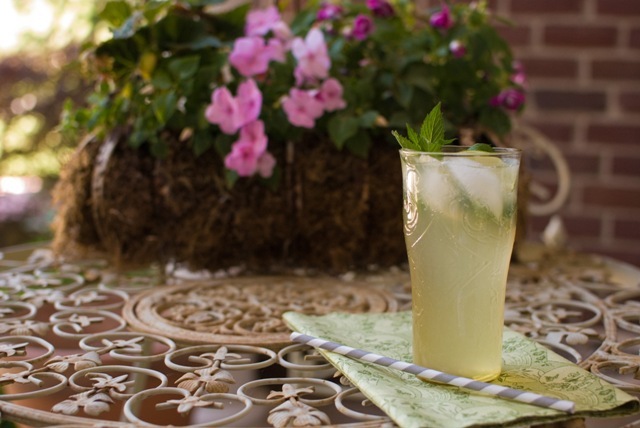 It’s fabulous and so refreshing during the summer months. It’s easy to make. I think you’ll love it. You will need a boat load of fresh ginger, sugar, water, limes and a bit of mint which is optional, but you really shouldn’t omit it. 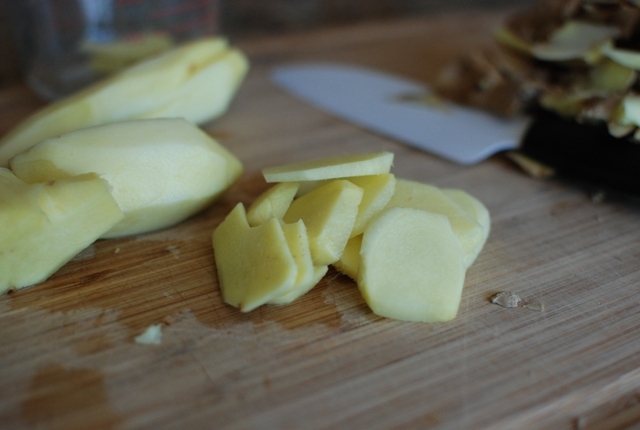 Peel the ginger. I just use a pairing knife and gently scrape the skin off. Slice the ginger. 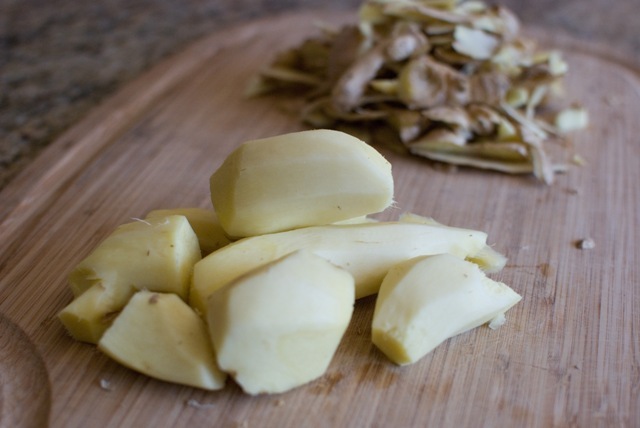 You will need 2 cups of sliced, peeled ginger. Place the ginger into a medium size sauce pan. Cover with a lid and let the mixture steep or stand for 1 hour. 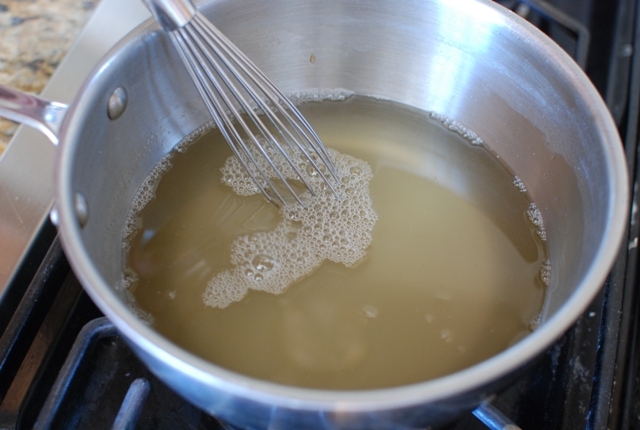 After one hour, remove the lid and pour the mixture through a fine mesh strainer. Discard the remaining ginger. 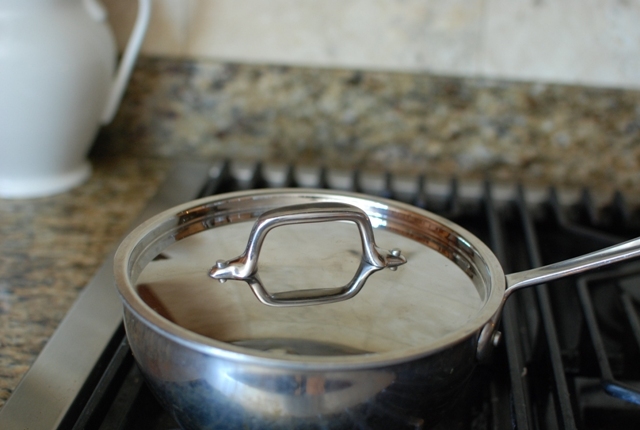 Pour the liquid back into the same sauce pan. 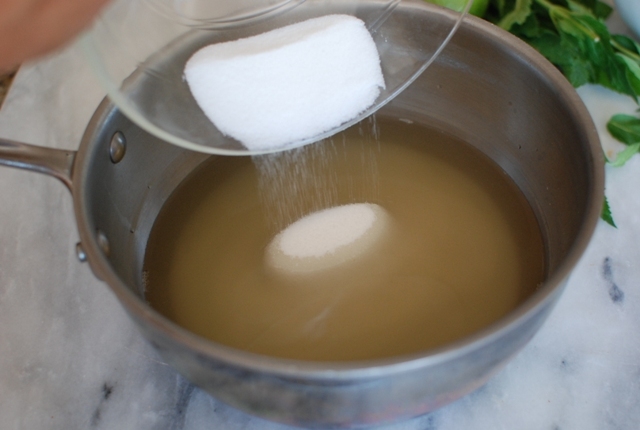 Add 1 1/2 cups of sugar and place over low heat. Warm the syrup just until the sugar melts. Remove from the heat and let the syrup cool. 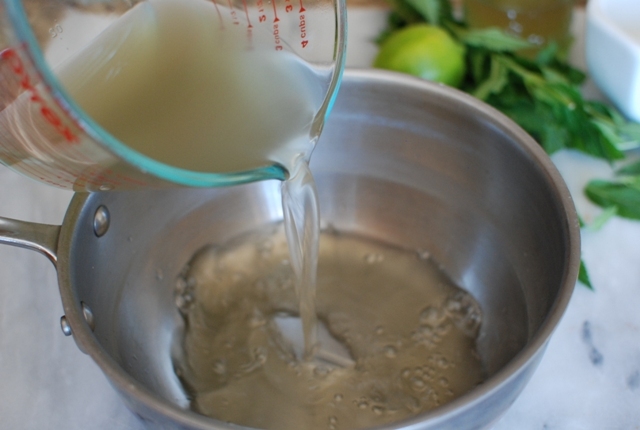 Pour the cooled syrup into a jar and refrigerate until ready to use. 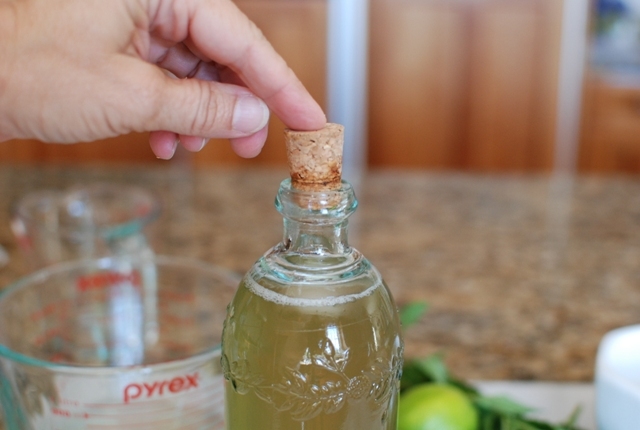 Make sure the syrup is nice and cold before making the ginger ale. Let’s make ginger ale. Please note that this recipe is pretty much based on taste. I’ll give you a few guidelines, but feel free to adjust to make your ginger ale to your liking. 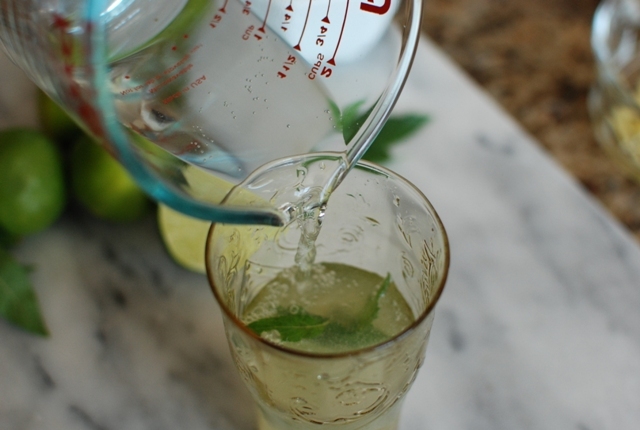 You will need chilled sparkling water, limes, fresh mint, ginger syrup and ice. 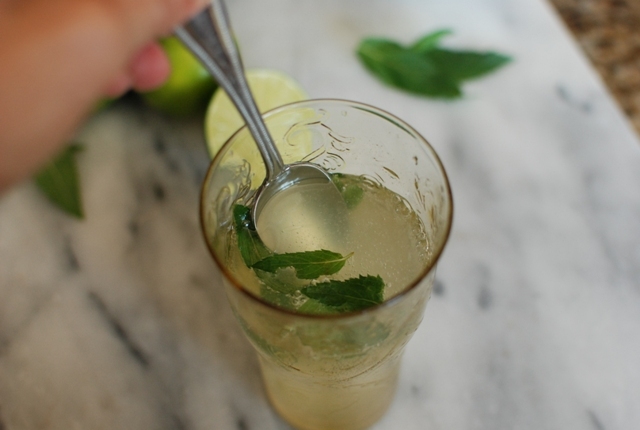 A good ratio to use is: 1 part lime juice, 2 parts ginger syrup and 3 parts sparkling water. 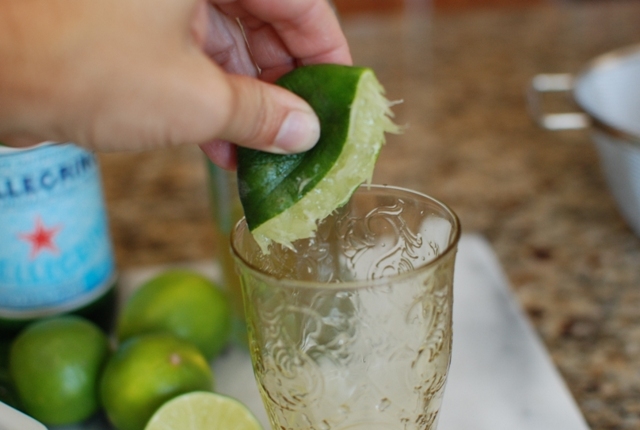 For an eight ounce glass of ginger ale, squeeze 1/2 of a lime into a glass. 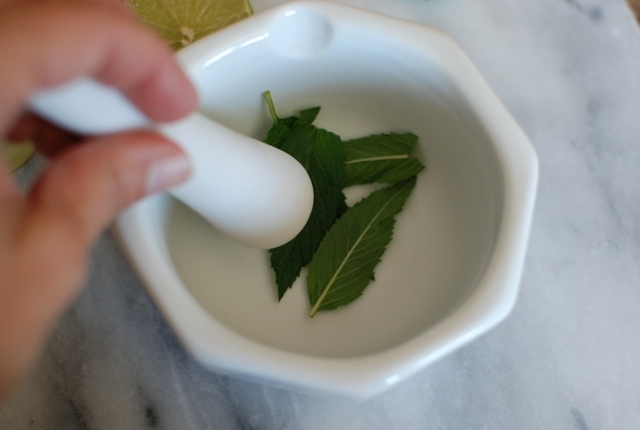 I like to bruise the mint a bit to release the flavors. I just pound the leaves a few times. 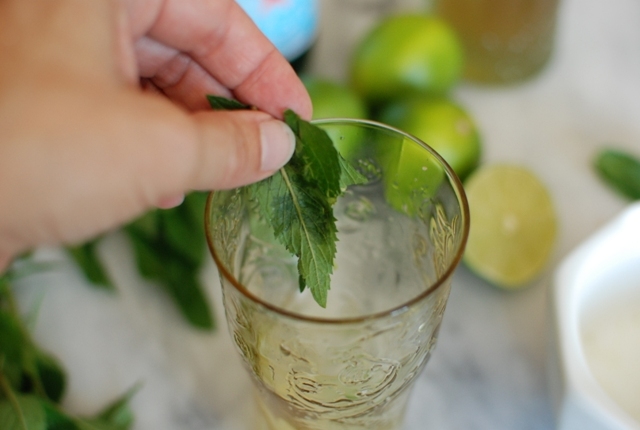 Add the mint to the lime juice. Oh, let me mention the use of FRESH-squeezed lime juice. Don’t go and buy that reconstituted crapola lime juice…please. Add the ginger syrup. About 1/4 cup. Now add the sparkling water to fill the glass. Leave room for ice. Just give the drink a stir to blend all of the liquids. Now you can add the ice. 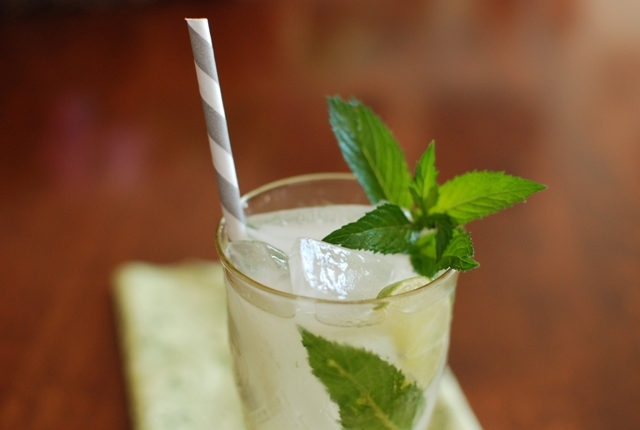 Top the ginger ale with a sprig of mint and a straw. Everyone is going to be so impressed. 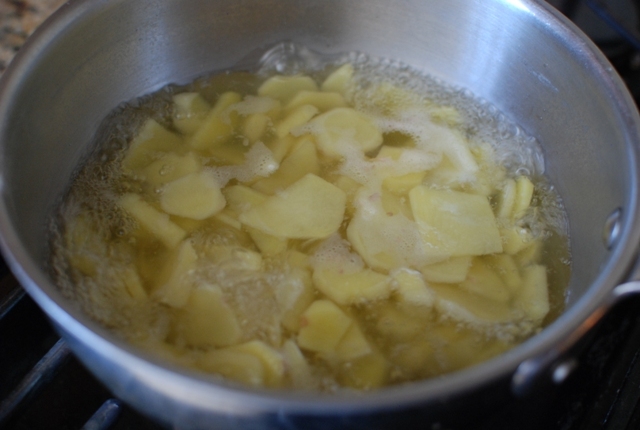 To make the Ginger syrup: In a medium size sauce pan, heat the water and ginger until it reaches a low simmer. Simmer for five minutes. Remove from the heat and cover. Let stand for 1 hour. 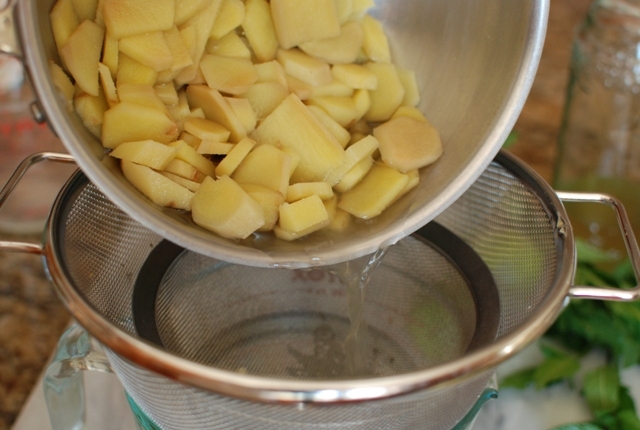 After one hour, drain the juices through a fine mesh strainer. Discard the ginger pieces. Let cool then place in a jar and refrigerate. 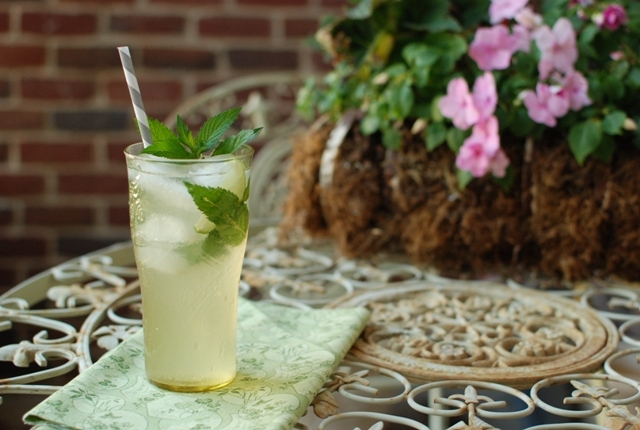 To make the Ginger Ale: In a tall glass, add 1 part lime juice (about 1/2 lime per glass), 2 parts ginger syrup, and 3 parts sparkling water. Stir to combine the liquids. Fill glass with ice. 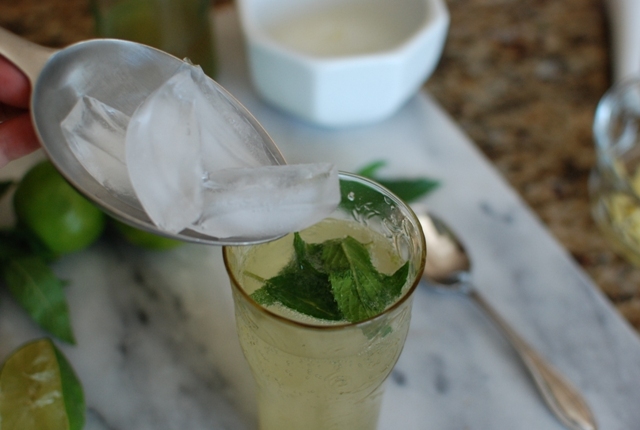 If desired, add fresh mint. Adjust to your liking. I always end up adding more lime juice. Thanks, Ry, for being our beverage connoisseur. Hi, I was just checking on uses of sparkling water when I bumped into your blog post. 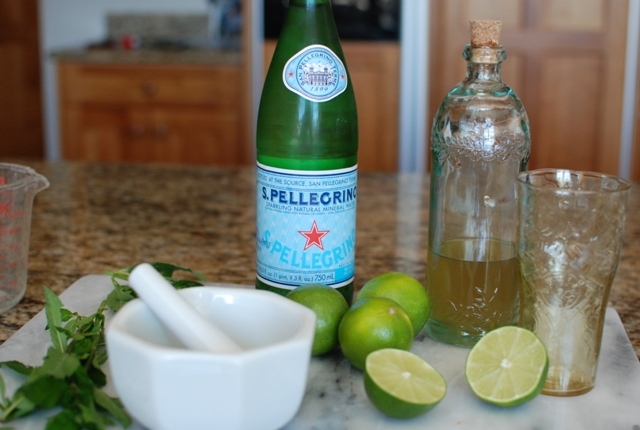 I would like to try your ginger ale recipe but I was just wondering if I can substitute lime with lemon. Please let me know what you think. Thanks so much! Sure, you can substitute with lemon juice. It's just a matter of preference. Use what you like and what is available to you. I bet that ginger syrup would be delicious in iced or hot tea too! Sounds great! I'll be making this one! Thanks! I have made ginger beer, but this seems a whole lot easier. I wonder how long the syrup will keep in the fridge? I have kept the syrup in the refrigerator for at least a month. This recipe is great, though I do have a bit of an issue regarding discarding the ginger after the process. 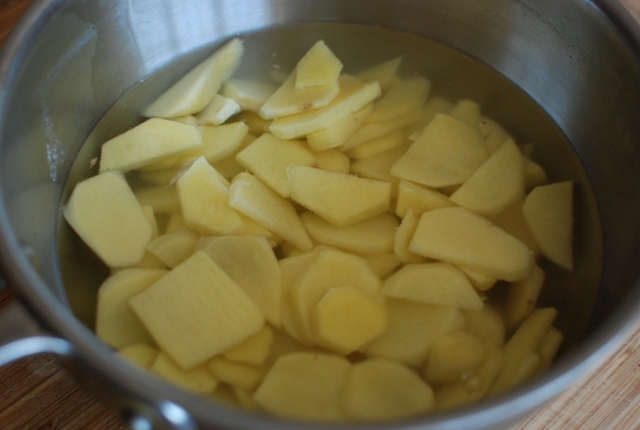 One could make candied ginger, or brew a ginger tea, or bake it into ginger bread, you could find an infinite number of uses for the ginger. 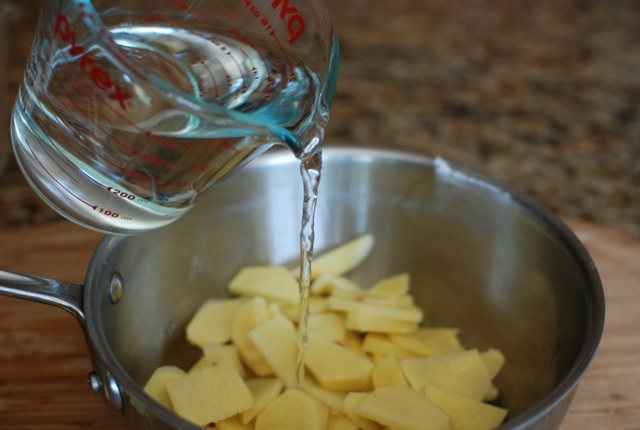 Its flavour will not have been spent after making this syrup. I completely agree. It does seem like such a waste. 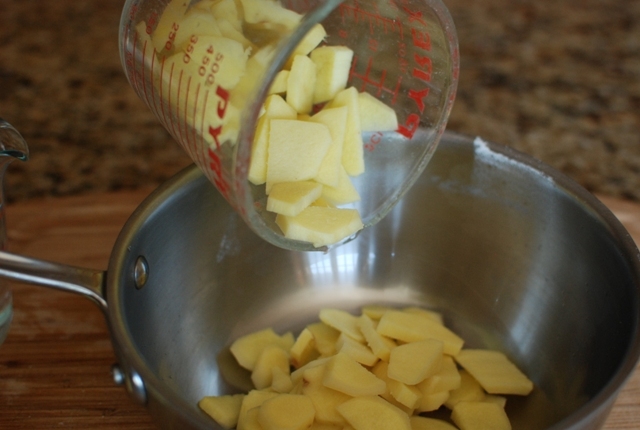 The candied ginger is a great idea. Thanks so much. Just tried this and I must say, SO refreshing! 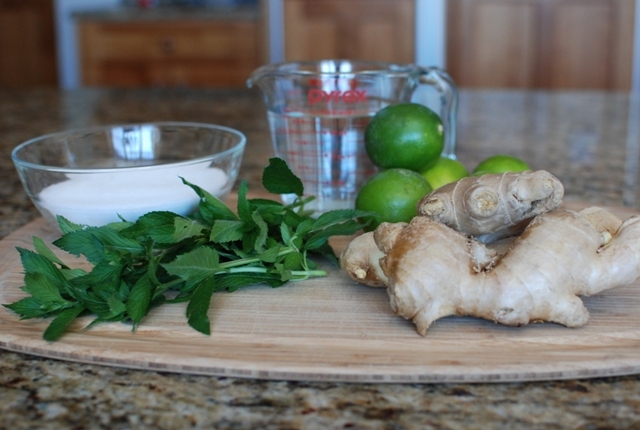 I use quite a bit of lime (I love lime) and to me it kinda taste like a virgin mojito with a nice zing from the ginger. Plus I bet it's awesome for stomach aches! My son swears by this drink for an upset tummy. Thank you for your kind comment. Hi Janet, just wanna let you know this recipe is fantastic! I kinda want to share it so I've taken your recipe and translated it to Chinese to put it on a Chinese website. I have cited your blog. (Click here if you wanna see: http://www.xiachufang.com/recipe/1045406/) If you don't like it I'll remove it. Again, it's sooo good! Thank you! Thank you, Ivy. I appreciate the link. Who knew I'd become international? Your site is awesome. What a fun site you have. Thanks for the link! I love this stuff. I'm so very glad I found this recipe. I've been craving gingerale for some time and now that I've been felled by a terrible flu it is the only thing that sounds good to me. My husband is steeping the ginger as we speak. I am certain it is just the tonic to restore me to health. Too melodramatic? I think it's the fever talking. Oh you poor thing. I hope this gingerale does the trick. My son swears by ginger healing an upset stomach. This is his creation and it certainly can't help. I hope you're feeling better soon. The flu is awful. Your husband must be a Saint. I think the addition of lime just might help as well. Get well. I was gonna ask a question along the same lines as Chrissy above, but was wondering about your thoughts on adding Stevia to taste instead of sugar for less calories. Sounds delicious – someone suggested this recipe to me on Pinterest as helping with pregnancy ills. I would totally try it. Just steep the ginger in the water. Strain it then keep the ginger mixture in the refrigerator. You could just add the Stevia for sweetening to your liking. My son will chew on a piece of ginger to help with tummy troubles. I hope this helps. I so don't envy you with morning sickness. Good luck. I love the flavor of ginger so the unsweetened would not bother me at all. I would love it. It wouldn't hurt to try. You could always add sweetener to your taste. Let me know how this works without the sugar. I'd love to hear. This looks awesome! If I enjoy club soda and lime juice by itself and LOVE Ginger Ale, do you think I would like it without sugar? I don't mind unsweetened stuff at all- I'm just curious if the ginger taste is too strong without it…either way, I think I'm gonna make it! Oh Yum! Let me know how the agave works. I'd like to know if you reduce the amount at all or if equal amounts work in the recipe. Wooooowwww …… Looks so damn refreshing !! Hi Anita, let me know how it works out for you. Enjoy. Oh wow! this looks delicious! I'm gonna have to try it this weekend…thanks for posting it! Hey Damsel, send me your email address. Let's chat! You have a fun site. I'm going crazy for this! It looks so amazing. Would you please consider allowing this to be reposted on my site? (Old School) It would be a perfect fit.